Drones are increasingly in the news these days, but I’d never heard them tied to ferries until Washington State Ferries director Lynne Griffith mentioned an incident in her weekly update. Recently, she said, the system has had reports of drones being flown over and near the ferries. Earlier this summer, one of the captains reported that a drone was posing a navigational hazard as he landed at the Anacortes dock The captain reported that it flew just feet away and directly in front of the pilothouse during the landing. Terminal staff found the drone operator and he is now the subject of a Coast Guard investigation. It is not always illegal to fly a drone near ferry facilities or vessels, but it is against the law to interfere with the navigation and operation of ferries, Griffith said. Is your Highway 305 commute faster now? The Department of Transportation says a little change at the Highway 305-Suquamish Way intersection has helped a lot. In response to community requests, state signal technicians monitored how the signal at the intersection was working. They found it was operating as programmed, but noticed that some highway drivers were allowing large gaps to develop between cars as they drove through the green light. At times the gaps were so large that the signal thought no cars were on the highway and prematurely turned red to let Suquamish Way traffic go. Based on that observation, they made a few changes. They tweaked the signal timing to let more highway cars through on the green cycle, and added another signal display on the highway for drivers leaving Bainbridge Island. It tells them whether the highway light is red or green as they approach the intersection, improving their ability to react to the signal. Traffic data gathered before and after the small changes showed a decrease in travel times from nearly 30 minutes to 17 minutes. Please respond here what your experiences have been. Washington State Ferries announced the winners in its first ferry photo. And guess what? Three of five submissions were from Kitsap, and we can claim No. 4 also. They were shot by Denise Sharer of Port Orchard, Darrel Austin of Bainbridge Island and Jeff Worrall of Kingston. Rebecca Nelson contributed another. The Bremerton native lives in Seattle now and is a cousin of venerated Kitsap Sun editor David Nelson. The final winner, determined by Jeanette Mills, Director of Visual Services at the University of Washington School of Art, Art History and Design, was from Anacortes. They all can be seen here. The weeklong contest on Twitter ended Monday with more than 200 photographs submitted. The winners will receive a behind-the-scenes tour of a ferry, along with bragging rights. Washington State Ferries will announce the winners of the ferry photo contest Thursday. Jeanette Mills, Director of Visual Services at the University of Washington School of Art, Art History and Design, will select her five favorite shots. I have it on good accord some of them might be from around these parts. Winners receive a behind the scenes tour. Go here and pick your own winners from the 217 entries. Got a couple ferry email alerts Thursday. At 11 in the morning, drivers were having to wait an hour on the other side to catch a boat to both Kingston and Bainbridge Island. That’s typical for getaway Fridays, but Thursday? At 11 in the morning? And for the first time ever this summer I’ve seen four-hour Sunday waits at Kingston. That got me to wondering what the ridership numbers are looking like. Washington State Ferries has them on its webpage, by quarter and year. First, some background. After WSF lost license tab money in 2000, it started jacking up fares, boats broke, the economy tanked. Ridership plummeted 17.2 percent through 2012. It finally turned around in 2013 with a 1.5 percent gain, followed by 2.7 last year. Through the first half of this year, it has spiked 4.5 percent. It’s rebounding with the economy and relatively cheap gasoline, says longtime WSF planner and Central Kitsap High alum Ray Deardorf. The mild winter and spring weather also contributed. The increases have been in discretionary and commercial travel, he said. Commuter trips have been stable or dropping, depending on the route. This last quarter, April through June, for example, there was an 8 percent jump in full-fare passengers (those without passes), while those with multi-ride cards and transit passes (commuters) declined 5 and 5.8 percent. Also last quarter, WSF carried 6,254,301 riders, the highest count in that quarter since 2002, Deardorf said. A couple new 144-car boats, Tokitae and Samish, have bumped 87-car Tillikum and Evergreen State, which didn’t hurt the numbers but probably didn’t add significantly, either. Two more boats will be arriving in the next couple years, which will retire the Klahowya, last of small, old ferries. During the second quarter, the Bremerton route gained 6.9 percent more riders, Kingston 4.5 percent, Fauntleroy-Vashon-Southworth 3 percent and Bainbridge 2.2 percent. 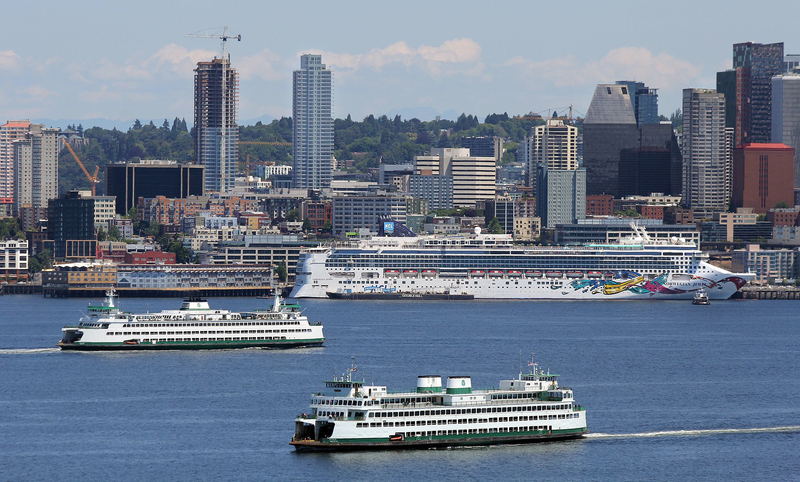 Lots of big boats, including two ferries and a cruise ship, accent the Seattle scene this weekend under bright skies. Expect more picturesque days this week as forecasts call for sunny skies and highs in the 70s. If you want to look at some incredible ferry pictures, go to #WSFcontest on Twitter. If you want to win some incredible prizes, share one of your own ferry photos there. Washington State Ferries is having a weeklong photo contest. It ends at noon Monday. You must follow the rules, the first of which is following WSF on Twitter at @WSFFerries. Submit photos with the hashtag above. You must have taken the photos yourself, at any time. They can be black and white Polaroids of the Kalakala. They have to have all or part of a state ferry in the frame. Captions won’t influence the judge, no matter how witty. It’s all about the image. Don’t take photos or tweet while driving, or enter restricted areas on a ferry. You can only enter three photos. If you send in more than that, only the first three will count. Jeanette Mills, director of visual services at the University of Washington School of Art, Art History and Design, will pick five winners. Her decision will be subjective, final and can’t be appealed. Winners get a one-year free pass. Wait, no. They get a behind-the-scenes tour of a ferry, and can bring a friend. You notice how they rigged it to have five winners but you can only send in three shots? That’s so you guys have a couple chances to win after I get my three. You know what? I’ve toured a ferry so I’m going to bow out and let everyone have a chance. Demolition of the Mukilteo tank farm has begun. The soil’s just no good for growing tanks there anymore. So they’re going to tear down the pier and make way for a new terminal to replace Washington State Ferries’ 60-year-old facility. The project will result in a cleaner Puget Sound because 7,000 tons of toxic, creosote-soaked timber piles will be removed, about 4 percent of the remaining creosote in the sound. 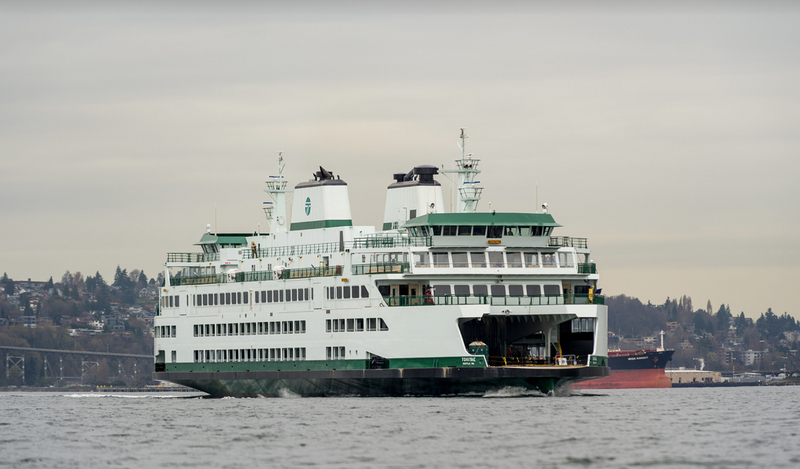 The multimodal project will bring critical improvements to the Mukilteo-Clinton ferry route, the state’s busiest for vehicle traffic, carrying more than two million vehicles and nearly four million riders annually. The new ferry terminal will separate pedestrians and vehicles for safer, more efficient loading. Its location near the Mukilteo Sounder Station will improve access to transit. The terminal will also be designed to better withstand earthquakes. Design of the new terminal is under way. The Washington State Legislature recently approved funding to complete construction of the terminal. The $129 million project will be paid for by a mix of federal and state funds. It is set to open in 2019.